Weibo goes Kandian~ | personal.amy-wong.com - A Blog by Amy Wong. Weibo just rolled its latest feature… Kandian integration. I am not exactly sure how Kandian.com (看点) works. 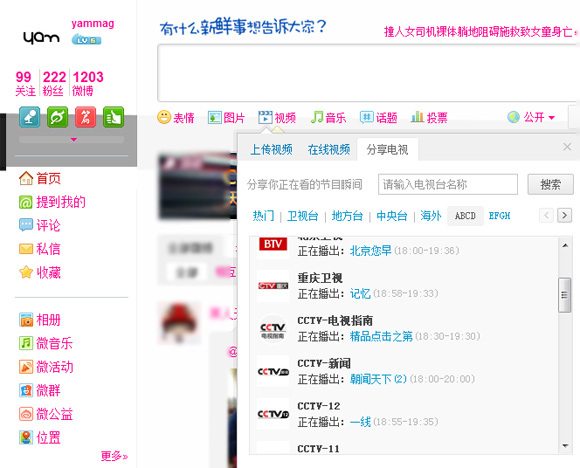 I’m a little overwhelmed — as I always am with the Chinese in the interface — but according to TechRice, it’s like Justin.tv. I’ve never really used Justin.tv because I’ve generally stopped opening new accounts to stuff that pops up online. I probably would have if I were 15 again. The pro about the Weibo and Kandian intergration is that you don’t need to do anything else. That’s it. You can just start using it if you already use Weibo. At the moment, my connection is being rubbish so there’s a lot of lagging every second or so. Though, that’s a general issue with Mainland-based websites… even when my internet is fine. 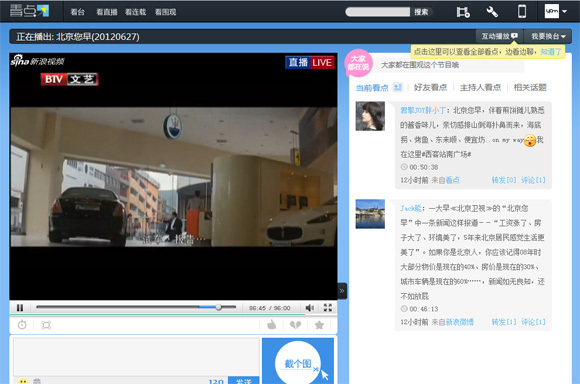 In any case, this Weibo/Kandian thing will allow you to comment on a live stream, see what your friends are watching and commenting on, as well as doing your own streaming. And since it’s integration, there’s no “app approval” like on Twitter and there’s no double-posting because once you do something on Kandian, it shows up on Weibo.